Your diners no longer have to travel to Indonesia to enjoy authentic beef rendang. You can just recreate this popular slow-cooked dish with this step-by-step recipe. Your diners will be ordering this again and again. 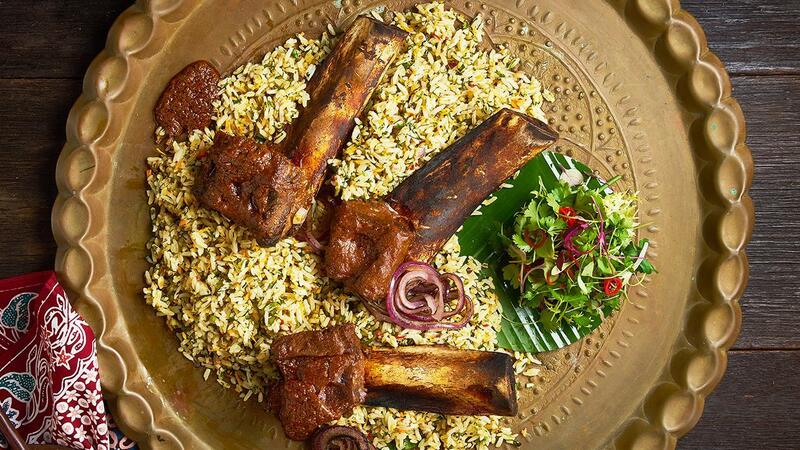 Marinate the short ribs with 150g of rendang paste, and keep chill for 1.5 hours. Sear the short ribs all around in a hot cast iron pan. In a separate pot, add oil and saute chilli paste and remaining rendang paste till fragrant. Add in water, lime leaves, turmeric leaf, and beef, and bring to a boil. Cover the pot and let it simmer for 1 hour or till the beef is tender. Add in coconut milk and sugar, and simmer for another 1.5 hours till the meat is tender soft. To prepare the rice, finely chop dried shrimp and fish, and stir-fry with a little oil for 2-5 minutes. Add in grated coconut, rock sugar honey sauce and water. Keep stirring till it turns lightly brown before removing from pan. Set aside to cool. In a large bowl, add in cooked jasmine rice, sauteed fish and shrimp, and all the finely cut herbs. Toss evenly, and add in the seasonings. To serve, portion out the herb rice and short ribs. Serve hot.